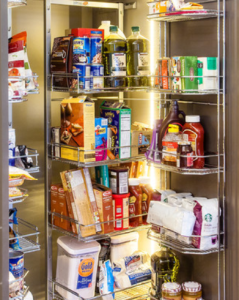 Pantry doors are a great, often not thought of, place for storage. 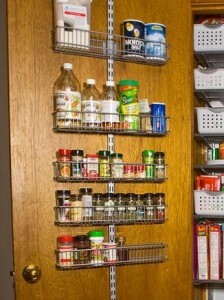 I may have mentioned another time that in our previous home my husband made me a spice rack to hang on my pantry door. I loved it. So when we had our new home built I asked the cabinet guy to put a spice rack on the inside of one of the cabinets. Well, when I saw it I laughed! The lowest shelf was the only shelf I could reach! 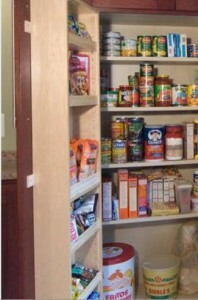 So my hubby took it off the cabinet door and hung it on the pantry door. It’s “fine”. But let me tell you the one he made for me was soooo much better! It was totally customized to fit even the large spice bottles. The one I have now only holds the small to not as small jars. It’s better than nothing though. He told me he would make me another one, but when he attached the new one to the door he used liquid nails, so the only way to get a new spice rack is to get a new door! I also, very recently, grabbed one of those plastic grocery sack holders from IKEA when I was there. 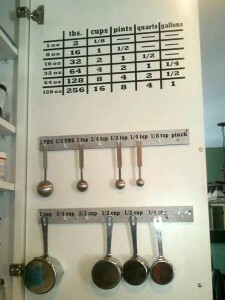 They come with two-sided sticky tape and I attached it to my pantry door underneath the spice rack in about 2 seconds. So cool! I should have gotten one years ago. So, that’s all. I was just thinking of this and thought I’d share. On second thought, let’s brainstorm for a minute. 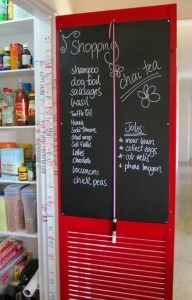 What else could you hang inside a pantry door or any closet door for that matter. And probably a million more!